If you live in Hawaii you know that almost everything is imported from chicken to toilet paper. In 2004, the last chicken processor in Hawaii closed. Because of the high cost of importing feed (corn) to Hawaii, commercial poultry production is no longer economically viable. This means Hawaii will have to pay higher prices for imported chicken in our grocery stores. For more than a century, Hawaii has relied on the families that have dedicated generations to keeping fresh eggs on local plates. Today there is less than a handful of these local egg farms left. Mikilua Poultry on Oahu is the largest in the state, selling under the familiar Ka Lei, Hawaiian Maid, Maile and Times brands. The Peterson Upland Farm is another egg farm on Oahu that has been in business for 100 years. Hawaii only has one chicken hatchery, Asagi Hatchery, selling chicks, eggs, and feed since 1935. They not only supply island egg farms with chicks, but also farms in Guam, Palau, Samoa and the northern Marianas. If Asagi Hatchery were to close, those farms would be desperate, because the chicks can't survive being flown all the way in from the U.S. Mainland. The Asagi Hatchery is located at 1830 Kanakanui St., in Honolulu. Website: http://asagihatchery.com/. Unfortunately it is beginning to look like Hawaii is in danger of becoming the eggless, chicken-less state, unless more of us support these struggling farms. Note: Nutrient-rich, all-natural eggs are a welcome addition to any diet. One egg has 13 essential vitamins and minerals, high-quality protein, healthy unsaturated fats and antioxidants, for only 70 calories. Tortilla is one of the most popular tapas dishes in Spain. It is basically a potato omelette, and is not to be confused with the Mexican maize tortilla. This Spanish tapa tastes great whether served warm, cool, or at room temperature. It makes an excellent breakfast, lunch, dinner, snack, or crowd-pleasing tapa. Heat the oil in a 10-inch nonstick skillet over medium-low heat, add the potatoes, and cook, turning frequently, for 10 minutes. Stir in the onions and 1/2 teaspoon salt. Continue to cook and stir for 25 more minutes until potatoes are tender. Drain all but 2 tablespoons of the oil and transfer the potatoes into a bowl. Wipe the skillet clean. Beat the eggs, paprika, and remaining salt and pepper together and stir in the potatoes. Heat 1 tablespoon reserved oil in the skillet over medium-low heat. Pour the egg mixture into the skillet. Cook until just set – 5 to 7 minutes. Loosen the sides with a spatula, place a heat-proof plate facedown over the skillet, and invert the tortilla. Heat remaining oil in the skillet over low heat. Slide in tortilla, cooked side up. Cook for 3 more minutes. Slide tortilla onto a plate. Cool slightly before serving. Note: I like to serve this as pupus (Hawaiian for appetizers) by cutting the tortilla into bite size squares or circles, then put a dab of sour cream on top of each square, then sprinkle chopped fresh chives or caviar on top. Makes 12 pupu servings. Crostini means "little toasts" in Italian. These little toasts are topped with finely chopped chicken livers, and lots of other good things. Place chopped anchovies on a cutting board and make a paste by dragging the side of a chef’s knife across them at a 15-degree angle about 10 times or until smooth; set aside. Melt butter in a medium frying pan over medium heat until foaming. Add anchovy paste, onion, salt, and pepper and sauté until onion is softened but not browned, about 5 minutes. Increase heat to medium high, add chicken livers, and sauté, stirring occasionally, until livers are browned all over, about 3 to 4 minutes. Add sherry and cook until most of the liquid has evaporated, about 2 minutes. Add chicken broth, capers, and sage and simmer, stirring occasionally, until almost all of the liquid has evaporated and the livers are cooked through, about 3 to 5 minutes. Remove from heat, transfer livers to a cutting board, and reserve onion mixture in the pan. When cool enough to handle, finely chop the livers until they’re about the size of popcorn kernels. Return livers to the pan and stir in vinegar. Serve on toasted baguette slices. Makes 6 to 8 servings. You and your guests will love these party chicken wings, laced with garlic. Combine sauce ingredients. Bring to a boil, then simmer for 5 minutes or until sugar caramelizes slightly. Strain the sauce to eliminate the minced garlic, then set aside. Season flour and cornstarch with salt and pepper and mix together. Dredge chicken in flour and cornstarch mixture, deep fry or fry in large frying pan. Dip in garlic sauce and serve. Makes 12 servings. Frisee is a feathery salad green with a slightly bitter flavor. It is a favorite spring time treat for me. 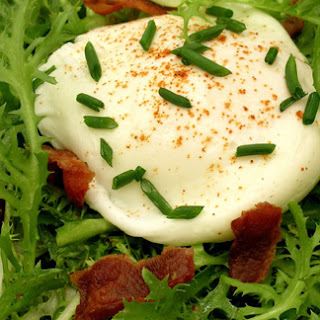 In France this salad is often called "Salade aux Lardons", combining tasty morsels of bacon with frisee, and then coated with a warm bacon vinaigrette dressing and topped with a poached egg. In a medium skillet, cook bacon over medium, tossing occasionally, until browned, 6 to 8 minutes. With a slotted spoon, transfer to a paper-towel-lined plate to drain. Set bacon aside. Pour off all but 2 tablespoons of bacon fat from skillet; return skillet to heat. Add mustard and vinegar; stir, scraping up browned bits until dressing is combined. In a large bowl, toss frisee with warm dressing. Add bacon, and season with salt and pepper. Serve immediately, topped with a poached egg garnished with a pinch of cayenne pepper and minced chives. Makes 4 servings. The pine nut actually comes from a pine tree, the pinyon pine, but doesn't taste at all like turpentine. It is common today for commercial gatherers to harvest thousands of pounds of pinyon seeds for distribution in health food stores and outlets for gourmet chefs. Season the chicken pieces with the salt and pepper to taste. Lightly dredge the chicken in the flour, shaking off the excess. Heat the oil in a large skillet. Brown the chicken, over medium-high heat, about 5 minutes. When the chicken is golden brown, scatter the pine nuts, peppers, dill, and garlic over the chicken, and add the vinegar. Shake the pan to distribute the peppers and herbs evenly. Continue cooking 5 minutes more or until the peppers are soft and chicken is cooked through. Adjust the seasoning with the salt and pepper. To serve: Lay 2 leaves of romaine on each of the four salad plates. Divide the chicken, peppers, and pine nuts between the four plates and garnish each plate with 2 wedges of tomato. Top each plate with a sprig of the parsley. Makes 4 servings. This is a simple chicken salad with a delicious Asian vinaigrette salad dressing. Bake chicken with salt, pepper and canola oil at 400˚F, until cooked through and juices run clear (about 1 hour, covered in foil). Let cool completely, then shred the chicken going with the grain. Lightly toast almonds in the oven at the same time as chicken. Be careful they will burn quickly. Cut romaine into 1/4 inch thick strips. Peel carrot. Once the carrot is peeled use peeler to peel carrot strips. Mix all ingredients in a bowl.For the dressing, chop the garlic and grate the ginger. Mix wasabi, Dijon mustard, rice wine vinegar, garlic, ginger, and soy sauce, in a medium size bowl. Make sure the mixture is well blended. Slowly whisk in sesame oil and canola oil until mixed well. Don't mix too fast or it will separate. This dressing does separate over time so you will need to remix the dressing before adding it to the salad. Makes 4 servings. Wraps are very popular these days. I think you will like this light, refreshing chicken recipe. Heat the olive oil in a large saute pan. Add the chicken, lightly brown one side. Add the sesame and chili oil, onion and water chestnuts. Finish browning the chicken. Add soy sauce and set aside to cool slightly. Lay out a dry lettuce leaves, removing the stem if stiff. Place a couple of spoonfuls of the chicken mixture at the stem end. Add cabbage, carrots, peas and cilantro. Roll the lettuce like a burrito. Repeat for the other leaves. Makes 8 servings. Coconut milk is used a lot in Asian countries, and here in Hawaii. It has a wonderful flavor, that works well with chicken. In a soup pot, saute garlic and onion in olive oil. Add chicken and 2 cups coconut milk. Then add black pepper, salt, ginger and vinegar. Bring to a boil and simmer uncovered until chicken is very tender, about 1 hour and 10 minutes. Add cayenne pepper. Add remaining coconut milk, stir and simmer 2 to 3 minutes until sauce is thick and oily. Serve over hot rice. Makes 4 servings. This delicious braised chicken dish is traditionally made with preserved lemons, which is basically lemons preserved in salt for months, then rinsed and used in Moroccan dishes. I have substituted lemon zest for those of us who may not have preserved lemons on hand. The lemon zest and olives work beautifully together, giving the sauce tons of flavor. Serve this dish with couscous instead of rice, you'll be glad you did. In a food processor combine the cilantro, parsley, lemon zest, and 1 tablespoon of olive oil. Process for 2 minutes or until herbs are finely chopped. Rinse the chicken with cool water, then pat dry with paper towels. Season the chicken generously with salt and pepper. Massage the chicken skin with the herb rub. Set aside and let the chicken marinate for 15 minutes. Heat a pan over medium heat then add sliced onion, garlic, and saute for 15 minutes. Add spices: black pepper, salt, ginger, saffron, and turmeric and sauté for 3 minutes. Add chicken thighs and the reserved marinade mix. Cover the pan and lower the heat; let the chicken simmer for 35 minutes. Add the green olives and simmer with the chicken for approximately 10 -15 minutes longer. Note: Do not add water or any liquid to this dish. Makes 4 servings. Pelau is an iconic one-pot stew from Trinidad made with either chicken or beef. Heat the oil in a heavy pot or skillet. With the heat on high, add the sugar and let it caramelize until it is almost burned, stirring constantly. Add the chicken (or meat) and stir until all the pieces are covered with the sugar. Reduce the heat to medium, add the onion and garlic and cook, stirring constantly for 1 minute. Drain the pigeon peas and add them to the pot along with the rice, water, and coconut milk. Reduce the heat and simmer, covered, for 30 minutes. Add the remaining ingredients, stir until well mixed, cover and cook until the vegetables are tender, about 20 to 30 minutes. The pelau should be moist at the end of the cooking time. Makes 4-6 servings. We enjoy the best mangos here in Hawaii. The key to this low-fat, low-calorie dish, is to use a fully ripe mango. Cut chicken breasts into 1-inch chunks. In bowl, stir together chicken, cornstarch, soy sauce and pepper; let stand for 15 minutes. Meanwhile, peel and cut mango into 1/2-inch chunks. Set aside. In a wok, heat oil over medium-high heat; stir-fry shallots until golden, about 3 minutes. Add chicken mixture, hot pepper and garlic; stir-fry for 4 minutes. Stir in mango and red pepper until combined. Add chicken stock, fish sauce, lime juice and sugar; bring to boil and boil, stirring, until slightly thickened, about 2 minutes. Stir in mint. Serve with plenty of Jasmine rice. Makes 4 servings. We have flan all the time in our house, it is a dessert that is enjoyed worldwide. This version adds coconut and rum to the mix for a delicious tropical island taste. Bring sugar and water to a boil in a small heavy saucepan over medium heat, stirring until sugar has dissolved, then wash down any sugar crystals from side of pan with a pastry brush dipped in cold water. Boil, without stirring, swirling pan occasionally so caramel colors evenly, until dark amber. Immediately pour into ramekins and swirl so caramel coats bottom of each, then put ramekins in a large roasting pan. Preheat oven to 350°F with rack in middle. Blend 2 cups milk with remaining flan ingredients in a blender until smooth, about 1 minute. Transfer to a bowl and stir in remaining 1 1/2 cups milk, then divide among ramekins. Bake flan in a water bath until just set but still wobbly in center, 1 to 1 1/4 hours. Remove ramekins from water bath and cool slightly on a rack, at least 15 minutes (flan will continue to set as it cools). Just before serving, run a thin knife around each flan, then invert onto plates. Makes 12 servings.